After 3 demos Swedish Legions of War was signed to the France based label Inferno Records to release their debut. The music on this debut is very aggressive black/thrash in the vein of old Kreator, Dissection, Immortal, Witchery, Swordmaster and Destroyer 666. Besides that, the band puts in some melodic parts, like in the songs "Proclamation of War" and "Reflections from the Past". The music is for the most parts influenced by old school thrash, the vocals are more black-metal influenced. The riffs can be described as rather catchy and the songs have enough variation. That keeps the music interesting from start to finish. I think that both people who are into thrash and those who are into real Black Metal will like this record. Take the song "The Sniper", which has a lot of similarities to black metal. The fourth song "Ensemble of Fear" is a rather melodic mid-tempo song and has a kind of Annihilator twin-guitar part in the middle - taking about variety! 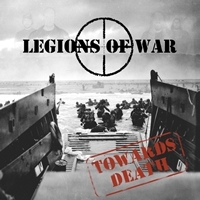 Legions of War combines the best of both worlds. Aggressive thrash with black pitched vocals and they don't forget to include the required melody and variation to keep it interesting. Fans of bands I mentioned above should check them out.